LifeNews.com recently released this article explaining the questionable licensing of Planned Parenthood’s abortion facility in Columbia, Missouri. Show Me 4 Life’s collection will be displayed in the capitol building rotunda tomorrow morning. Our team looks forward to seeing you there! 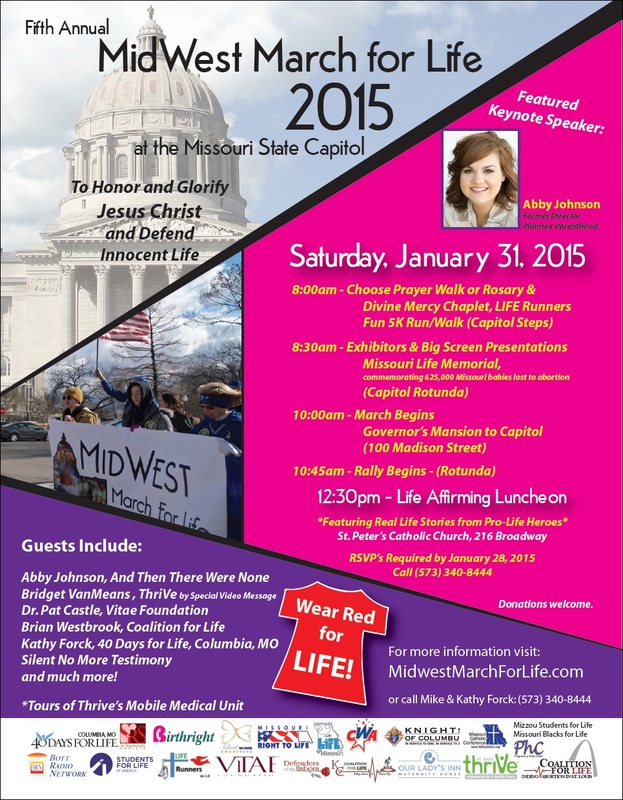 Come join MidWest March for Life in their 5th annual march and rally! Visit http://www.midwestmarchforlife.com/ for more information. January is National Sanctity of Life Month! If you would like to have Show Me 4 Life’s collection displayed in remembrance of Missouri’s abortion victims, please click here to request a showing. January 2014 display at St. Mark’s Catholic Church. This Wednesday, Missouri state legislators will attempt to override Governor Nixon’s veto of two critical pro-life bills. Pro-life supporters are gathering in the Capitol Building Rotunda to prayerfully show their support of this legislation. Please come join us! Run for Their Lives–KC has invited Show Me 4 Life to join them for their second annual 5k! This fundraiser (sponsored by Cornerstone Community Church) will benefit Advice and Aid Pregnancy Center and Show Me 4 Life. For more information visit http://www.runfortheirliveskc.com/. 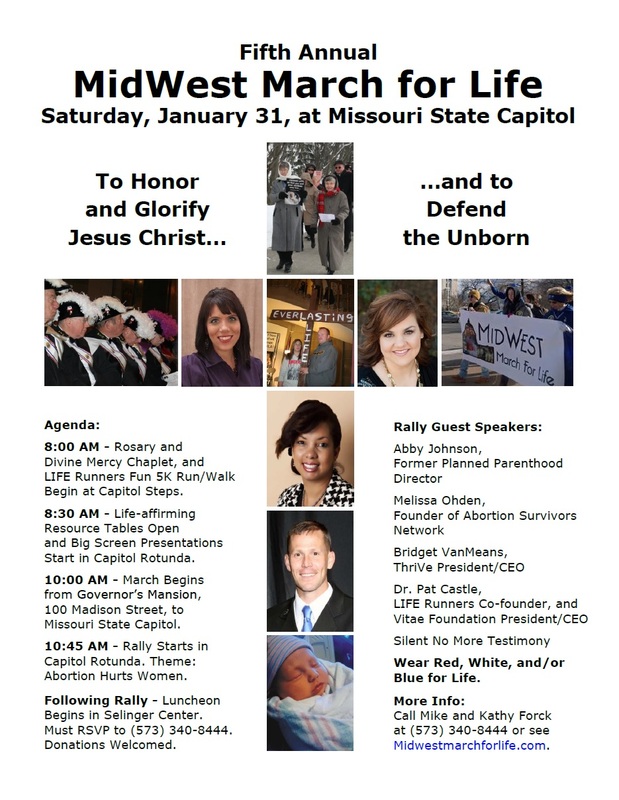 As you all know, Show Me 4 Life has been working to establish a Missouri Abortion Memorial. In Phase 1 we have been collecting one diaper/safety pin to represent each of Missouri’s 625,000 abortion victims (both in and out-of-state). This stage of the memorial is now financially complete. The final order for pins has been placed, and I expect to see them shortly. Part of our goal has been to make 625,000 a number so large it cannot be ignored. Although there are only 580,708 pins in the picture below, I think we have certainly accomplished this goal! (The remaining pins will fill two more containers.) If you would like to have the collection displayed in churches, schools, or pro-life gatherings, please let me know. Thank you all for your continued prayers and support of this endeavor. May you be richly blessed in your efforts to defend life!